How to Make Further Misery for Children with Cancer - Charley Brady - Opinons; My Own. Chicago’s ‘Irish American News’, July 2018. I have a story to tell. And because it is about a children’s cancer charity that is very dear to my heart, it’s not a good story. Nor do I think that my tale will have a happy ending. It is a story that is only one of many chapters in the ongoing and very strange Saga of Ireland’s Health Service Executive (HSE). Somewhere along the way the HSE lost its way, you see: it became not something that helped people, but instead went very consciously out of its way to hinder and harass them; badger and obstruct them; frustrate them and add to whatever miseries they were suffering through. TAKING AWAY FROM CHILDREN WHO HAVE CANCER. 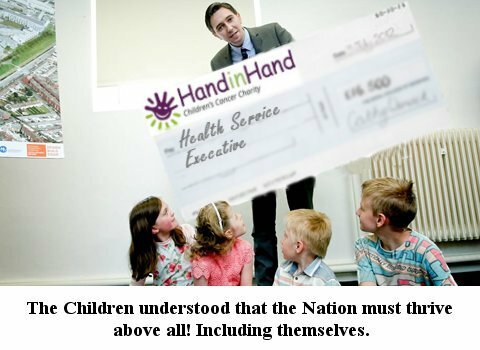 In 2008 the HSE made a firm, written commitment to help the children’s cancer charity ‘Hand in Hand’ to the tune of €450,000. Now, that’s a very pleasant, melodious tune. And for a small charity that has its back perpetually to the wall, it was sweet to the ear to learn that they would have a little bit of extra monetary resources to help the kids and families that they care about. €300,000 had come from the closure of another charity which recognised the enormously important work that ‘Hand in Hand’ does. The remainder was to come from the HSE in what I can only guess had been a sudden rush of blood to the head. And as we know from the ongoing cervical smear tests scandal they’re about as good at sharing information as they are with sharing money. It didn’t take long for them to recover, mind; they quickly wiped off their sticky little paws and decided that – you know, instead of helping out children with just about the worst disease you can imagine – maybe that money would look better in their coffers. Because ‘Hand in Hand’ hasn’t seen that money since. Where did it go? Well, down the rabbit hole with Alice and the Mad Hatter, for all I know. A statement from the HSE indicating that they were not acting as an intermediary is even at odds with one of their own documents. Some clues had come in when the charity was accidentally sent on some internal HSE emails. It would not be correct to call these ‘leaks’ since they weren’t. They were just one more example of utter incompetence on the part of an organisation that has become too monolithic for its own good. (On discovering their error, they even asked for them back, pretty please!) In fact, you would have to be some kind of warped genius to even get SACKED by them these days, so untouchable have they become. “It goes without saying that [Hand in Hand] does not need to know that the funding is being reduced by half in 2009”. Ah, those innocent days when we didn’t realise that it was going to go from half to €400,000 shy of the original – and that was after a decade of pulling teeth. Well, even that would have been nice. If you believed in the fairies at the bottom of your garden, the unicorns at the end of your street and the ability of the HSE to utter one whole sentence that even comes close to resembling the truth. Yeah; I think that’s my favourite one by a long shot. The HSE took money that was meant for sick kids and used it for themselves. All those years that an Irish children’s cancer charity spent in trying to find out what had happened to their money… and it was gone all along. They might have saved hard-pressed workers a bit of time if they had just said that in the first place. As regular readers of this column will know, I became aware of ‘Hand in Hand’ some five years ago. I was at that time so knocked out by what they were doing that I’ve been an occasional volunteer there ever since. To say that what this team of two people do is extraordinary is a bit like saying that Beethoven wrote a few decent symphonies and could hold a couple of nice piano concertos in his head. Five years ago they looked after and assisted the families of children with cancer over eight counties; today, due to sheer willpower and the fact that they have a huge waiting list, they are covering every county in Ireland. They also have an unpaid Board who don’t take even petrol expenses for driving out to the village of Oranmore in County Galway, where they are based. A REAL charity, in other words, not a business. “We are now utterly despondent. Multiple attempts to meet up with the Minister [for Health, Simon Harris] have come to nothing. We have tried to engage with the System, but the obvious contempt that the HSE holds for us and what we do is just simply blatant and demoralizing. “People often ask me how we can work in a field that must be so draining to the emotions. Yes, there is heartbreak; of course there is. But overall we find ourselves mainly surrounded by people who are incredibly positive, despite everything that is thrown at them, despite being at terribly low points in their lives. I continue to deal on a one-to-one basis with so many who simply refuse to even countenance anything except positivity that it is — more often than not — a joy and a privilege to come in here every day. “It is so disheartening to find that the real negativity comes from those who should be helping us the most, such as the HSE. It has been a pure privilege for me to be even tangentially associated with ‘Hand in Hand’ these past years. They don’t deserve the shafting that they are getting from the HSE. Then again, who does? Jen, when it comes to the HSE, I would have to think: With no bother at all.